It seems we take two steps forward and one step back these days. Today was a step back. I will say, in the big scheme of things, of all days ever in the hospital, this day has not been a big deal but for the sake of progress getting out here, today was a setback. It started last night when they started adding half formula to the Pedialyte she was getting in her feeds. She gagged and coughed like she might vomit and so we hurried up with the Zofran, in case Hana was nauseous. Then she fell asleep but tossed and turned and would wake to go to the potty or have a loud, dirty diaper. I felt like things were getting worse since adding the formula so I discussed with her nurse and said I thought we should switch back to just Pedialyte. The fellow agreed since she didn’t want Hana to get dehydrated, especially the night before getting her Cidofovir infusion. They switched to Pedialyte and the rest of the night was quiet. The next morning I told the resident I thought the formula was just trouble. Hana had a good amount of diarrhea in the morning. In rounds they discussed this at length since Hana does not seem to be improving but getting worse with the formula. They decided to consult with the GI team. I wish I had asked about this a few days ago when I had a feeling things were not going well. Since adenovirus is often more of a GI thing and not a cardiology thing it only makes sense. Until the consult with GI they decided to only give Hana Pedialyte. They talked briefly about giving Hana TPN (IV nutrition) but decided to wait until they talked with GI. The other news from rounds was that her Tacrolimus level is within goal range, finally! 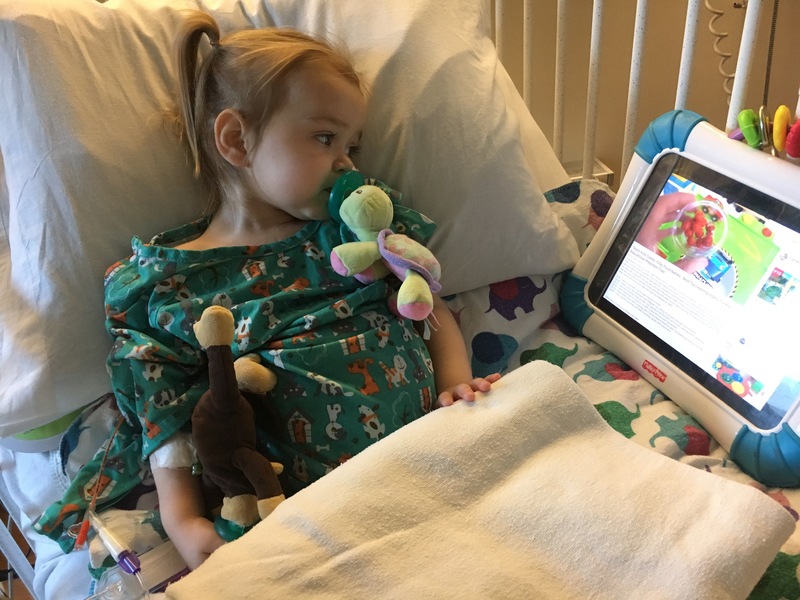 But her neutrophils count is low, low enough to say she’s neutropenic which means her bone marrow is not creating enough white blood cells and so Hana is at much greater risk of infection. So, they went through all her medications and decided to stop or temporarily hold those that may be affecting this. Ugh. I hate the word “Infection”! They also decided they need to step up their watch for rejection of her new heart with an EKG and echocardiogram now being done weekly. This gave me shivers, partly because it’s sounds like we will be here long enough for Hana to have weekly echocardiograms! After that, things were really busy all day long. The nurse started all the preparation for Hana’s Cidofovir infusion. Hana started asking for cookies, which she never does, so I ran down to the cancer center for cookies or similar (they have the best selection). As soon as I returned the resident called me to tell me that the GI doctor’s first glance recommendation was to not let Hana eat or drink anything for at least a few days. I sighed a big sigh, let Hana have one tiny nibble of cookie (because I promised) and then hid all the food, snacks and everything related to eating and drinking in the room. After that and for the rest of the day whenever Hana asked to eat, which she did often, or she cried for food, I told her that I wanted to give her food but the doctors said she couldn’t have it. I just can’t be the bad guy on this one, not when I’m going to have to be the one later down the road who is going to be encouraging her to eat. It’s just too much to ask of her to understand. I offered her lots of water and later I got her ice chips. Hana’s infusion started and the GI fellow showed up to examine Hana and talk to me. From what he was saying it sounds like we are going to be here at least another week or two. He said Hana’s gut needs to rest and heal and they won’t know how long that will take but they will reassess every couple of days. They ordered a bunch of stool tests too. Fun stuff. He wanted to wait until the stool test results came back before starting TPN. Unfortunately, we weren’t able to get a good stool sample the rest of the day. Maybe tomorrow. 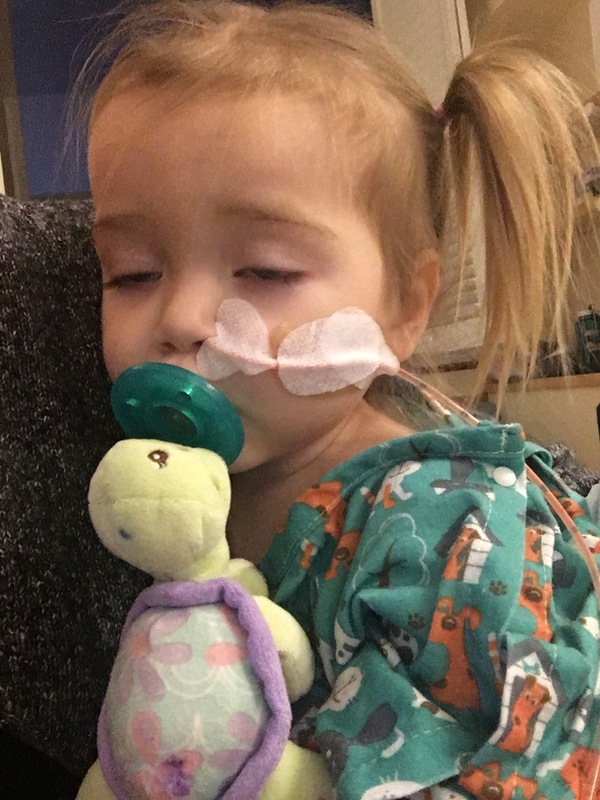 Then Hana had to get her PICC line “fixed” (easy fix) then an EKG, then a very long echocardiogram and then her PICC line dressing changed and by then it was 3:30 pm and nap time had come and gone. Her echocardiogram looks fine, thank goodness. The next few hours were LONG as Hana cried a little about wanting food, not to mention she was tired, still had diarrhea and was bored and depressed. I tried to get her to play or look at books but she just pushed everything away. All she wanted to do was play her musical cartoon videos on YouTube and the ONLY ones she wanted to watch were about food (especially ice cream which is when I got her ice chips instead). I can’t wait for the day when I can hide the iPad forever. Tomorrow I may try harder to get her interested in other things but today she just seemed miserable. These kinds of days are long for me too. I don’t really like to leave Hana for too long, although now that she’s older it seems (so far) a little easier. I can tell her that I’m going to run to the kitchen or the front desk and she is fine with it. Mostly. But it’s hard not to get a break. I’m also getting tired. I keep thinking the end is near and then it isn’t and I’m still tired. I hope tomorrow goes better! Continued well wishes for Hana! You are her greatest advocate! Stay strong for her! Poor little darling. It is time for some good things to come her way. Please, God. Help little Hana.